The year was 1976. The University of Central Florida had only been open for 13 years as Florida Technical University. It wouldn’t be officially UCF for another two years. Bicentennial fever had hit the country. From condiments, to cans, to condoms, everything was covered in red, white, and blue. 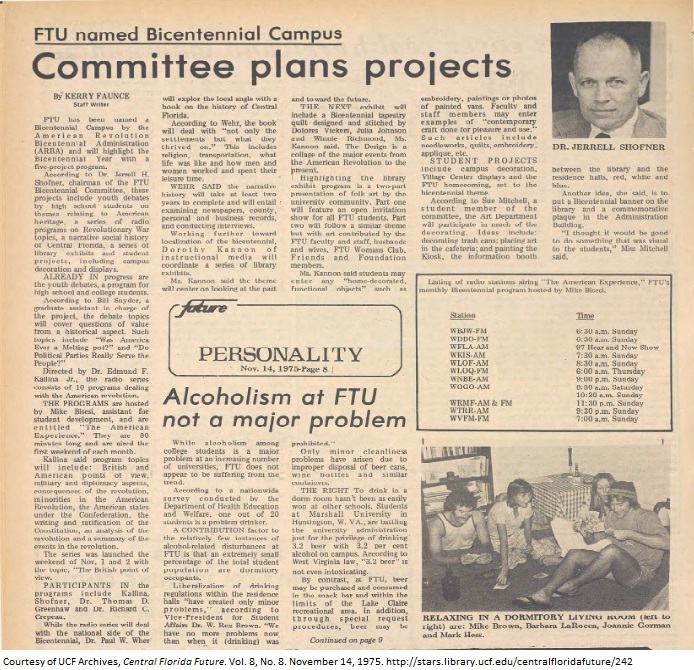 FTU had just been named a “Bicentennial Campus.” Aside from numerous events and celebrations on campus, one professor decided to have his students collect all of the memorabilia connected with the Bicentennial. Dr. Crepeau, a history professor at what was then FTU, sent his students on a mission to find every kind of interesting, ordinary, and even scandalous object that was made just for the occasion. The students found magazine special editions, paper cups, posters, glassware, a kite, a frisbee, cereal boxes; you name it, and they probably found it. 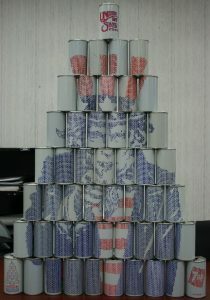 The most impressive commitment to the collection was when the students banded together to find 50 7-Up cans that created a pyramid sculpture of Uncle Sam. A little bit of good ol’ fashioned dumpster diving helped complete the full set! Dr. Crepeau’s collection continued to grow until he and his students had amassed nearly 10 boxes of Bicentennial objects! The collection was so large that it even drew national attention when it was chosen to be featured on Jean Shepherd’s America. Dr. Crepeau was interviewed and showcased his collection on their Bicentennial special. 40 years later. The year is 2016, and the collection lives on. Affectionately named “Bicentennial Junk: the Good Dr’s Collection,” it will feature in UCF’s Art in Odd Places on November 9th and 10th in Colbourn Hall 534. We hope you have a chance to see this incredibly piec e of history that is probably not saved anywhere else. 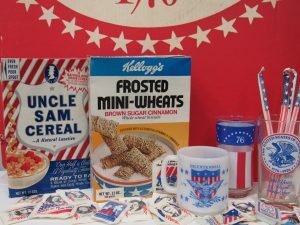 Who knows, maybe 10 years from now or 60 years from now during the 250th or 300th anniversary of American independence, current UCF students will look back at this collection as inspiration for their celebrations. If you can’t make it to the exhibit, be sure to check out our “collections” page for more information on Dr. Crepeau’s Bicentennial Junk.